Marcin (Spock) SO5HMF i to co mnie interesuje. Story started quite differently than you may expect. My initial plan was not to play with my weather station, but with remote control to my vacuum cleaner :) I have Miele brand vacuum cleaner with remote control buttons located on gripping part of pipe where you usually hold cleaning pipe. I was trying to reverse engineer that. There were no markings on device about its working frequency so I use cheap DVB-T dongle supported by rtl_sdr libray as my spectrum analyzer and GNU Radio as a frontend. First step is of course to find working frequency. I assumed that it will work on 433MHz or 868MHz or 2.4GHz band. That was easy - I spotted nice signal on 433.82Mhz My initial step was to discover modulation used by this device. Since this is only home appliance I was not expecting QAM256 :) I focused on trying to get some bit stream by experimenting with ASK,FSK,GMSK. I started with ASK and that was first good shot. In fact my vacum cleaner is using OOK (On Off Keying) modulation which is extreme type of ASK where you switch on/off carrier. By using GNU Radio FFT and Scope sink with low pass filter I saw that I have regular pulses of something what was interferences from my perspective. You can see this as decaying line close to the right of main signal. It is hard to catch < 1 s pulse.. I knew that this must be some other devices in my vicinity. Since pulses were rare this must be something energy efficient. My first suspects were SMART Water meter with radio transmitter or heat logger mounted on my water powered heaters. Both are made by Ista and have radio interface. They are waiting for my free time to start hacking them :) After some walking over my house with laptop and DVB-T dongle I ruled out both of them, and then I remembered about my weather station since signal was strongest near part of house where it was located. Some time ago I bought cheap 30 PLN (~7,5 EURO) weather station in Biedronka shop. For those who are not familiar with this name it is a shop network directly competing with Lidl on Polish market. They sell mostly grocery but they have some home cheap china electronic stuff also. Quality is mostly crap but you can find some rare oportunieties.. 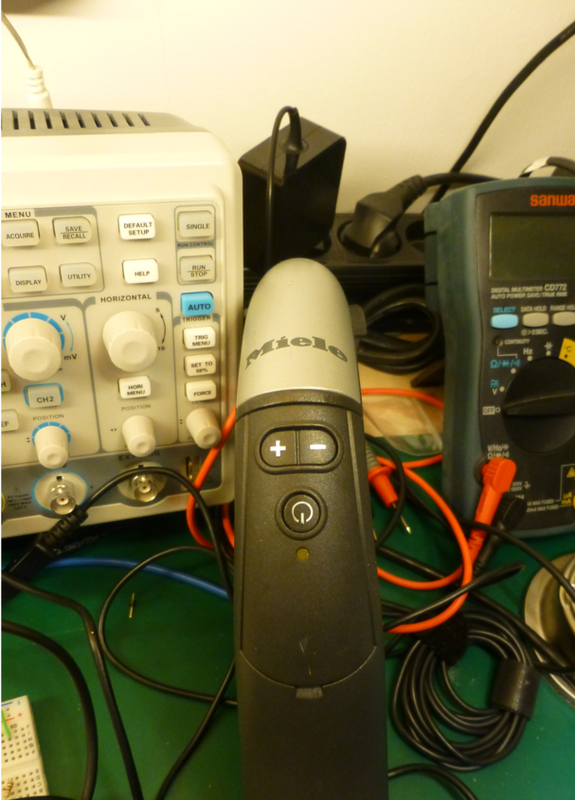 Remote unit model part number is WS-9941-M. As you can see there is a mark that it is working on 433 MHz band. Clearly it was my source of interference. Unfortunatelly I'm still learning GNURadio and I was able to see data on screen however I was unable to make setup to dump this data to file. I went to my neighbor radio shack shop AVT. It is really neat to have such well stocked electronics shop just 10 minutes bike drive. I bought ZS-RR10-433MHZ 433.92 MHz radio reciever for 20 PLN (~5 EURO). This is really neat device - you just plug in to power, put some antena and you get demodulated signal on one of the pins. As you can see there is clearly pattern here. 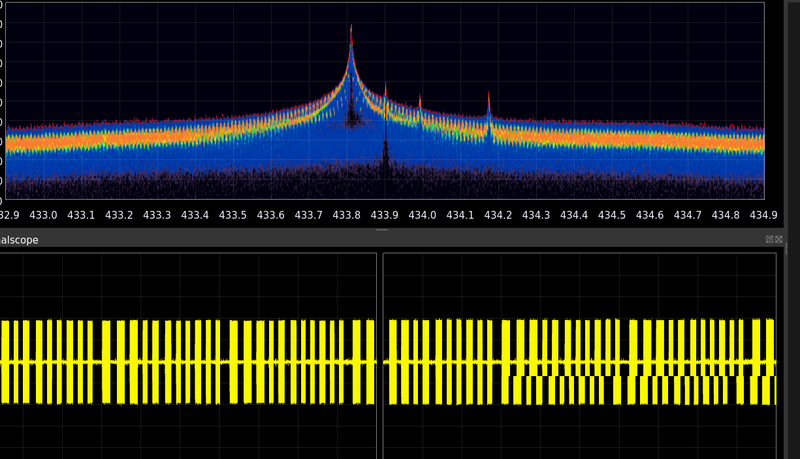 First what you see is sync packet contains three pulses and then delay ~ 9ms. Then is pattern repeated 10 times. We have pattern here but what exacly "0" and "1" are represented ? I search web page for any similar devices. Unfortunately there is not many such pages. I found Fred's webpage, and rc-switch Arduino library. I looked into source files and none protocol was similar to mine. I dumped data from Salae to CSV file and started write some python stuff that will try to get something from those data. Since such chip devices shouldn't be very efficient with float operations and temperature resolution was 0.1 deg I expected that station will multiply temp value by 10 and this should be value - and assumption was right. Where is "-" mark ? The only difference between negative and positive data are next 4 most significant bits you see on bold in table. Now it is time to make some hardware to receive data from my unit and put them to PC via USB/UART, and put my temp data public. I have some STM32, PIC32, KL25Z,Atmega MCU's laying arround. But this is story for next part. In fact temperature is encoded (probably) in 12 bits signed format. I tested only up to ~ 40 C deg by warm up sensor above 25,6 C deg. In order to check if bits 10 and 11 also containg temp data I would have to warm up device above 51.2 C deg. :-) Maximum temperature with 9 bits would be 51,2 C deg and this comply with sensor range from specification which is -25 - +50 C de, and I don't need higher values so example above decodes just 9 bits. Dzisiaj trochę rantu na naszym rodzimym koniu do bicia - PKP. Pociągami jeżdzę sporadycznie i niewiele się w tym temacie zmienia. Są jednak pozytywy. Ostatnio jechałem EIC do Poznania i byłem bardzo pozytywnie zaskoczony jakością taboru. Czysto, klimatyzacja, gniazdka 230V, bar w pociągu - normalnie żyć nie umierać. Z technicznego punktu widzenia jedyne co przypomina stare składy to skrzeczący jak przez stary radiowęzeł personel pociągu informujący o stacjach, podróży itp. Jeśli chodzi o organizację nadal tragedia :(. Jechałem z kolegą, który miał bilet kupiony normalnie w okienku, ja zaś jako nowoczesny podróżny miałem kupiony on-line. Przy powrocie z Poznania okazało się, że zdążymy na wcześniejszy pociag (też EIC) dzięki czemu będę 2h wcześniej w domu. Jak się okazało konduktor bez problemu może zabrać mojego kolegę z normalnym biletem wcześniejszym pociagiem i wystawić miejscówkę. Ja za to mam jakiś magiczny bilet, który jest niezmienialny i musiałem czekać 2h lub wydać 130 PLN na nowy bilet. Jak widać w PKP bycie nowoczesnym się nie opłaca. Drogie PKP - jak już coś robicie (sprzedaż on-line) - nie róbcie z ludzi, którzy wam oszczędzają i czas i kolejki przy kasach pasażerów drugiej kategorii. Postanowiłem sobie zbudować analizator antenowy w/g koncepcji VK5JST z rozszerzeniami kolegi SP2JJH. Wszystko udało się bez większych problemów, analizator ruszył od pierwszego włączenia. Niestety wszystko psuła jedna mała "rzecz". Na żadnym posiadamym przeze mnie wyświetlaczu nie wyświetlał się prawidłowo symbol Ohma czyli litera Omega. Zajmuje się hobbystycznie też programowaniem mikrokontrolerów, ale jak dotąd nie miałem okazji bawić się PIC'ami a tylko AVR'ami, MSP430 oraz procesorami ARM Cortex-M0. Analizując z pomocą Arduino co tam mają pod adresem 0xF4, którego używa oryginalny program w każdym LCD jaki miałem był ten sam "krzaczor". Ponieważ chciałem aby rozwiązanie było przenośne postanowiłem wykorzystać dostepną pamięć CGRAM. Wycieczka do AVT po programator PIC i zacząłem zabawę. Każdy wyświetlacz ma pierwsze 8 rejestrów dostepnych jako zapisywalne przez użytkownika dla jego własnych symboli. Co do szczegółów odsyłam do Wikipedii gdzie jest szczegółowy opis sterownika HD44780. Największym problemem okazało się skonfigurowanie środowiska MPLAB 8 z kompilatorem CC5X używanym przez VK5JST. Dwie godziny potem środowisko było gotowe i kompilator prawidłogo kompilował oryginalny kod. Jeśli wcześniej zadeklarujemy małe makro np: pragma bit LED_0 @ PORTB.0 to potem zmiana stanu tego portu to poprostu LED_0=1 ! Żadnych &= ~() czy |= na całym rejestrze. Bardzo przyjemna i czytelna sprawa. Pomimo "dziwnego" interfejsu MPLAB 8 - bardzo szybko można zacząć pracować bez dziesiątek wizardów, innych utrudniaczy, czy importowania dziesiątek bibliotek. A jak wyglądają owe zmiany. Tutaj znajdziecie źródła z moimi poprawkami oraz plikiem wsadowym hex do PIC'a ant-anl-0.04.zip. Napisałem do Vadima, więc może niedługo znajdzie się to w oficjalnym kodzie. Każdy bajt opisuje jakie pixele mają być włączone dla każdej z 8 poziomych linii znaku graficznego 5x8 pixeli. Tak więc znaczenia ma tylko pierwsze 5 bitów. I to wszystko. Tak więc programowanie PIC'ów nie takie straszne i w sumie poza drobnymi niuansami różnic pomiędzy 8-bitowcami nie ma. Eco server iConnect - part 1. A little of soldering. As I mentioned in my fist post here is first part of my story how I made eco server out of Iomega iConnect. Floppy (for those who don't know what it is - here is explanation) power cable have the same pin raster like iConnect connector so it will fit perfectly. I removed on of wires from floppy cable since RS is using only 3 (RX,TX,GND) and moved color cables in original floppy cable between positions so black is GND, yellow is TX and red is RX. I decided to place jack near RJ-45 socket since this is the only place where is enough space to make such output and it was safe to drill hole without removeing front panel. Please be carefull when making hole for jack socket - hole will be close to PCB - if your drill will "touch" board you can brick your device. Now I have full console access to my iConnect on every PC and I started fun with software installation. This will be described in my next post. I'm sysadmin for many years and I had always my "private" server. My last one in my home was Epia VIA600 Mhz based powered by FreeBSD. Unfortunatelly after my father visit who accidently remove power cord using his foot (still don't know what he was doing behind my desk :) ) board was gone. I decided to build new one, but this time I was looking for something more eco-friendly and less noisy since my "home server" is in my main room (technical wire obstacles). After some digging I found SheevaPlug. That was almost perfect. Only problem is that it is not avialable in Poland and I had realy bad experience with Polish Post Office, so buying it outside Poland was last resort. Then I found this (http://www.plugapps.com/index.php5/Portal:Hardware) webpage. Segate Dockstar and Iomega iConnect are avialable in Poland :) I choose iConnect because it have 802.11n WiFi card (ralink RT3090) and more RAM (256MB). I was afraid that install might be problematic because there is not many webpages discussing Linux installation on iConnect but I was open to try. I had some experience with embedded hardware in past so that was not so hard, however there are some issues I would like to share with you on my next post about Debian installation on iConnect.